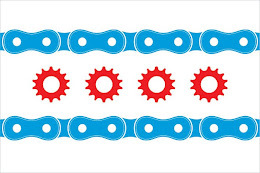 The Bloomingdale Press is reporting that the pro-bicycling group Carol Stream Bikes has requested that a pedestrian island be added to County Farm Road at its intersection with the Great Western Trail. County Farm Road is a very busy street in a part of Chicagoland that has seen massive growth over the past 20 years. Current traffic control devices may not be sufficient for current needs.